Every year, our girlfriends and I gather the #Momsquad and try to get the hell out of dodge. This year, we were going on a cruise. 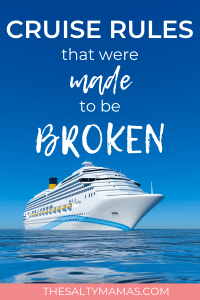 Driving down to the cruise terminal, I was excited, anxious, and had a list of things that I was – and was NOT – going to do. Then a wind came by and those rules were GONE with it. So, in the grand traditions of buffets, check out our list of rules, take what you like, and if you don’t end up using it – who cares? You can always come back for more later! Okay, so we didn’t really think we were going to keep this one, but we just didn’t want our whole trip to be us talking nonstop about our kids. Especially since we are doing this to get a break from them. We love our kids, but it would be nice for the chance to also miss our kids. Which is how two days in I ended up sitting there waiting for Harry Potter Trivia to start scrolling through every picture I’ve ever taken of my kids. And damn, those kids are cute. Looking at those cute little faces, you can almost forget the tantrums, the sass, the specific requests they have for which water cup to use….and then I shut it down, turn back to my friends, and get my trivia on. 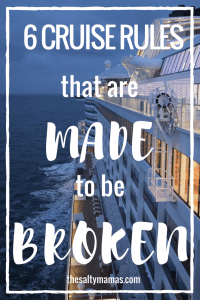 One of the best things about a cruise is all that food that I didn’t cook – and don’t have to clean up after. As Moms, we rarely get to scarf down a piece of toast while it’s still warm, so a luxurious 6 course meal is the ultimate in luxury. Which means we ate that way every single night. Thinking a hamburger sounds good while you’re sitting in the jacuzzi? It’s only 100 feet away! Go for it! Need a little chocolate? Oh, there’s a chocolate buffet at noon today! 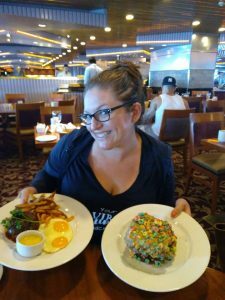 Can’t decide between steak and eggs and Fruit Loop crusted French toast? GET BOTH! No indulgence is too much, and yes, you and your crew may spend the entire day you get home frantically texting people about how much weight you gained in 72 hours but you won’t get to eat that way for another year, so don’t worry about it! Yes, buying the drink package means you can also have all the lattes that you want, but despite our love of caffeine, we were going to moderate. Until the barista made really good coffees that we got to drink while hot at any hour of the day or night. Up before everyone else? Grab a coffee, sit by the window and enjoy the view. Feeling a little sluggish after second breakfast? Bring a latte to bingo. Need a boost before karaoke? Coffee! (This time with a shot of Kahlua!) On a cruise ship you learn it is never too early, too late, too hot, too cold, too anything for just one more cup. Related Post: Is There Such a Thing as Too Much Coffee? Of all the things I needed most, it was sleep. I was coming off three weeks of someone in my house being sick and a week solid of having FIVE people sleep in my Queen sized bed every night. I don’t think I’d slept in such short chunks since the newborn days. By golly, I was going to sleep for days. Nap on the Lido deck. Sleep in until noon. Go to bed at a reasonable hour. And the first night, I sure was in bed by about 10:30. I even slept in all the way until 7:50! I was off to a great start. And then I never slept again. No naps, rolled into bed at 3:30 and up by 6:30, stayed awake for all the things, and came back so. completely. exhausted. I’ve been on dry land for 48 hours and I am still a complete and total Mombie. But with sooooo many memories that I put on a smile, wipe the sleep from my eyes, and do the things. Sure, we want to bring our kids home a little something to let them know we were thinking of them, but really – do our kids need stuff from a little roadside stand? No! We can grab them a box of Lucky Charms from the buffet and call it a day. It’s a consumable so it won’t be some piece of crap hanging around the house forever, it’s FREE, and the kids will think it’s awesome. Win – win – win. Then we got off the boat. 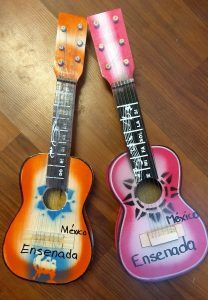 And realized that our kids NEEDED tiny guitars. Like desperately. How were they going to get their Coco on without tiny little guitars? Well it just wouldn’t do. And luchador masks?? Uh, yes please! They definitely need to wear actual Mexican wrestling masks when they play fight! SO we trudged back onto the boat with plastic bags filled with all the things our kids didn’t need, but more smiles on our faces for being the fun Moms that throw restraint to the wind and buy all the stuff. I brought three books. On a three day cruise. I was so incredibly sure that I was going to spend hours reading lazily by the pool, in bed, waiting for friends to show up for lunch. But trivia! Kareoke! BINGO! Needless to say, I read about ten pages of one book the first night before bed and then never so much as cracked a spine the rest of the time. But really? I can read today. Or tomorrow. Or when the kids are at the YMCA. But when else am I going to be able to hang out with my best girls watching a Harriest Chest Competition and laughing until we almost pee our pants? I’m not. So the books can wait. Overall, we had an amazing time, even if we broke every rule we made. What rule would you make – and break? 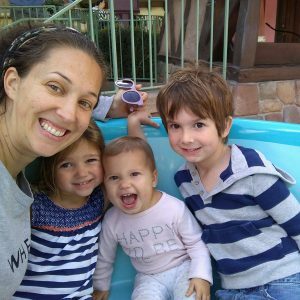 Want more vacation tips from The Salty Mamas? Check these out! Sometimes rules are MADE to be broken, and we sure did make and break them on our Momsquad trip!